12 Blueberries plus some for decorating. Boxcutters, Teaspoons, Jigger, Muddler, Shaker Classic/Boston, Skewers, Strainer, Coupe Glass. 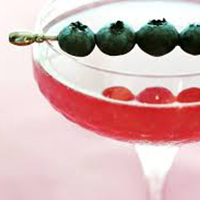 Place the blueberries in the mixing glass of your shaker, and cover with the lemon juice. Muddle gently until the lemon juice turns a nice dark pink. (Don't go too crazy with this: there is no need to smoosh the blueberries all up, just get the juice out.) Add all the other ingredients, and ice, shake shake shake and then double strain (you'll definitely want to double strain this one, to get out all those floating blueberry bits) into a glass befitting the loveliness of this lovely drink.